This is my second time living abroad in London and I’m a sucker for a good view. I’ve been all around the city and I am always searching for places to catch an epic sunrise or watch a relaxing sunset. These are my favorite places to see the best views of London. Best part? They’re all free! The Tate Modern is my new favorite that I wish I knew about earlier. Located in the Southwest end of town, the Tate is a museum with a new, refreshing flavor. I can’t lie, sometimes I’m not exactly thrilled to go to history museums but the Tate puts a spin on the classic museum. I don’t recall being bored for even the slightest second. After you’re done roaming the exhibitions, head to the fourth floor and over the bridge to access the Tate’s rooftop terrace. Here’s where the fun happens. Take the elevator up to the top floor for 360 views of South London. The view is stunning and is best enjoyed with a cup of tea or a wine in hand from their cafe. The museum is free to enter so this view is too. Money Saving Tip: If you’re 16 - 25, sign up for the Tate Collective to get £5 admission into exhibitions and 20% of all food & drink. YAS! Sky Garden is infamous in London. It’s located on the tip-top of a swanky office building in East London. When you get to the top you will be surrounded by lush palm trees and epic city views. There’s a restaurant upstairs (fairly pricey) but if you’re looking to stay within budget just grab a pastry or coffee from their cafe. Although Sky Garden is free, you have to book a time slot online. The online tickets state that you can only stay inside for an allotted time period but that wasn’t enforced when I went. It’s typically fully booked 1 - 2 weeks in advance but they do accept a certain amount of walk ins per day. Don’t forget to book before you get arrive to London! You will probably read about this central London gem on other blogs but I thought it was worth mentioning. Primrose Hill is tucked in a cute corner of the royal Regent's Park. This free viewing spot is popular amongst locals and visitors. Londoners flock here to catch the sunset with a picnic in the summer or for a chilly sunrise in the Winter - either way the panoramic views from here are stunning. 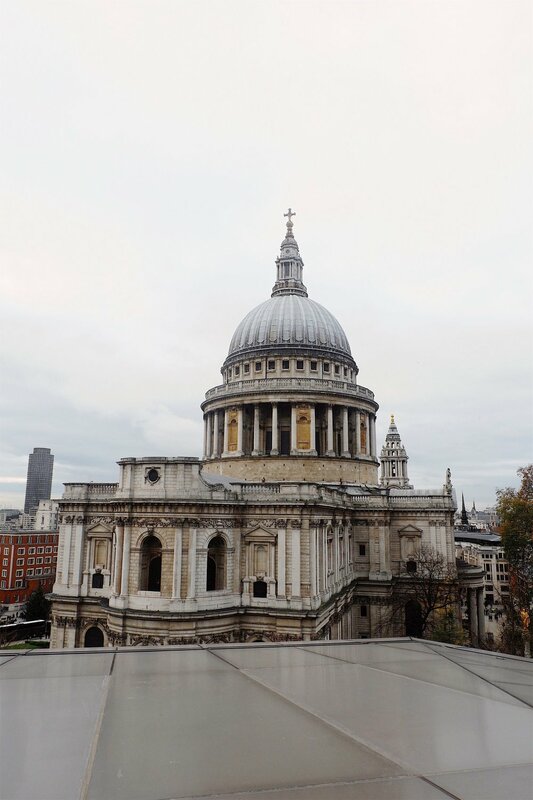 If you want to see epic views of the St.Paul’s Cathedral and get the quintessential ‘I’m in London’ gram’ then head to the rooftop at One New Change. This is one of the best views of London because it’s free and is surrounding by restaurants and shopping. Take the elevator in the center of the shopping square up to the top and you’ll find a wide open terrace with a lot of photo opportunities. Trying to pop on IG? Come here at golden hour (this is typically about an hour or so before the sun goes down and the sky has a golden hue) and you will leave with gorgeous photos. One new change is centrally located so it won’t be too hard to get to if you’re staying in zones 1 or 2 while in London. During your visit to London, chances are you’re probably going to end up in the West End. This is where the famous theatre shows happen but its also home to Leicester Square, one of London’s busiest hubs. When you’re done doing tourist tings, pop into Hotel Indigo in the heart of the square for awesome rooftop views. I’ve found that a lot of people don’t realize that hotels are public spaces. I used to work in hospitality so I’m not scared to walk into any hotel around the world and stay there all day, hogging the WIFI or chilling in their lobby without having a room. Hotels are totally fine with people who aren’t guests popping in for a drink, to work or in this case- to check out the views of London. Head straight past the front desk, to the right and up the elevators to the ninth floor where you will be met with sprawling views of pretty little London. This is one of one of my favorite views because it’s a hotel not a tourist sight so you won’t be bombarded with too many people trying to get the same pictures as you. I also love the view from here because its a picture perfect London skyline - you can see the London eye from the top! Come here, order a drink if you want or don’t - these views are absolutely free. Which do you love more - Sunrise or Sunset? Comment below!